Many soccer players, who are highly motivated, hold themselves back by trying to play perfect soccer. They expect the very best out of their performance all the time, which can be both positive and negative. Some advantages of perfectionism are having a strong work ethic, desire to improve, and commitment to their goals. Clearly we want our soccer players to set challenging goals for themselves, but many athletes who are perfectionists get upset or frustrated when they make even small mistakes. Wanting to improve and perform at your highest level is not the problem. The problem is when soccer players are so self-critical that any little mistake in a game causes them to lose focus or check out mentally. What are some other disadvantages of perfectionism that undermine your mental game of soccer? Perfectionists often see their performance as black or white, good or bad. Any mistake made can lead to these athletes feeling dissatisfied with their performance, which can hurt confidence and lead to frustration. In addition, many perfectionist soccer players struggle with fear of failure. Fear of failure can create anxiety, tension, and difficulty performing under high-pressure game situations. Soccer players who fear failure are thinking so much about results that they cannot focus in the moment. To improve your composure, you must address some of the underlying mental game challenges associated with a perfectionist mindset. A large part of maturing as a competitive athlete in any sport is understanding that perfection is not possible and not a good goal. Strive for perfection and mastery in practice, but accept you are human and that mistakes are going to happen in games. Instead of thinking you must play perfectly, create some manageable goals about your performance, such as getting back on defense quickly. Learn to be more accepting of mistakes in order to move forward and focus on the next play or goal scoring opportunity. If your performance is being held back by a perfectionist mindset, check out our mental game coaching programs that will help you remove these mental barriers. 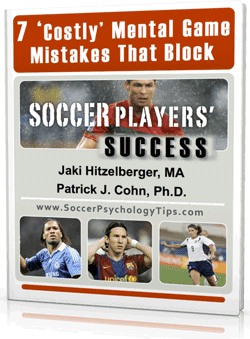 Download our free e-book, “7 Mental Game Challenges that Block Soccer Player’s Success”, and learn how to overcome other mental game barriers soccer players face. 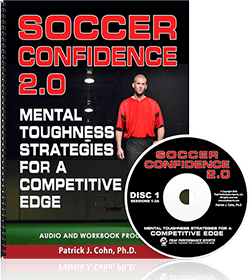 Learn Mental Game Secrets to Soccer Confidence! Does your confidence seem to disappear when you go from practice to games and don’t know why? Do you get nervous and anxious in big games or when you are under a ton of pressure? Do you get so frustrated when you make a bad pass which causes your confidence to sink? Learn proven strategies to improve focus, composure and confidence so you can perform at your peak in games! Players: Get the mental edge by learning how to take control of your confidence, mentally prepare for games and perform with composure under pressure. Trainers: Learn how to give your students the mental game advantage. Coaches: Boost your team’s confidence using simple proven mental strategies. Parents: Help boost your soccer player’s confidence. Don’t let their mind hold them back any longer. What are soccer confidence customers saying? Do You Make Any of These ‘Costly’ Mental Game Mistakes? 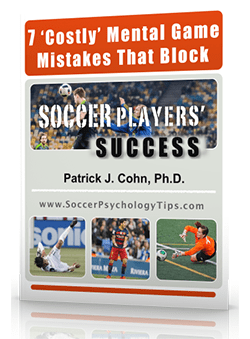 Download our FREE soccer psychology report and discover if you make any of these ‘costly’ mental game mistakes that can block your success. How your soccer mind can be your best or worst asset on the field. How frustration and dwelling are your worst enemy. If you are using your soccer mindset effectively before games. Learn the important mental game of soccer skills you need to master to boost your confidence and performance. What are soccer psychology subscribers saying? We look forward to helping you improve your mental toughness! Can Mental Coaching Help Your or Your Athletes? See if You Can Benefit From Soccer Mental Coaching! Contact Us Today for a Your Sample Session. Is The Mental Game the Weakest Link in Soccer?